iOS 9.3 was released to the public on March 21, the same day as Apple’s big event where it unveiled the iPhone SE and iPad Pro 9.7 (both of which are now available, by the way). Yet here we are just 10 days later and the company has deemed it necessary to already issue an emergency update for its mobile operating system. iOS 9.3.1 is now rolling out to supported iPhones, iPads, and iPod touch units across the world. Its only function is to fix a very nasty bug that somehow made the cut to the final version of iOS 9.3. This bug will render your Apple device useless after tapping on links in Safari and other apps. 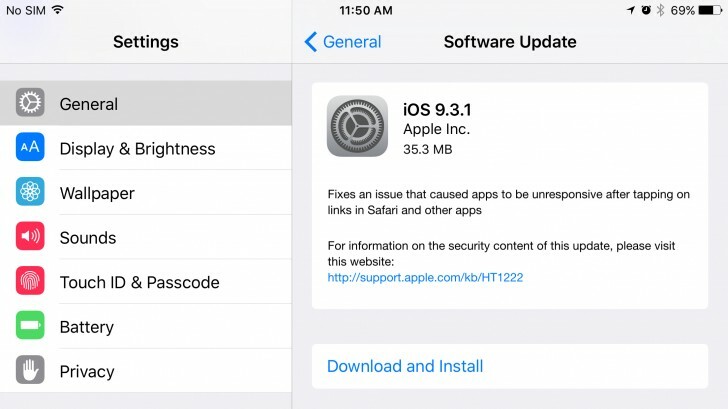 Thankfully, after you update your device to iOS 9.3.1, the crashing and unresponsiveness associated with tapping on links in certain circumstances will happen no more. So clearly this is one update that you should apply as soon as possible, especially if you have been affected by this bug. Nothing else is included in this iOS release, so you don’t get any new features or anything like that. Then again, iOS 9.3 itself comes with plenty of those, and it’s only been out for everyone since last week, so that makes perfect sense.